What's With the Demolition Dust? Tearing down an old home can release dust containing asbestos or lead. Curious City and City Bureau found that Chicago rarely enforces demolition laws meant to minimize exposure to these contaminants. This report was produced in partnership with WBEZ's Curious City. You can listen to the full audio report above. Questioner Robert Beedle wondered if there are any health impacts associated with the demolition of old homes. He became concerned after walking past a demolition in his McKinley Park neighborhood (Courtesy Robert Beedle). Robert Beedle can still remember the frustration he felt one day last spring, when he watched two houses, located across from the daycare near his home, get pulverized to the ground. The dust flew everywhere, and the leftover debris sat there for days. Robert is not an expert on demolitions — but he knows a lot about the old homes in his McKinley Park neighborhood. When he was thinking about renovating his 19th-century house, he learned there were harmful materials like asbestos and lead in the walls and floors. And there are many old homes like his in the neighborhood. Which is why the demolition he witnessed that day seemed almost absurd: How was it that these two old homes could be torn down with potentially dangerous dust and debris scattered everywhere? A backhoe lays the foundation for the construction of a new building at the site of the McKinley Park demolition that inspired Robert's question (Photo: Manny Ramos). What are the laws around the demolition of residential buildings in Chicago, and what implications does this have for health and the environment? The effects of hazardous building materials has been well-documented. Dust from asbestos can cause serious long-term problems, such as the fatal lung cancer mesothelioma, and lead that is ingested can cause severe developmental delays in children. Health and environmental experts don’t agree on exactly how much exposure to these poisonous contaminants is safe, which is why they want to minimize exposure as much as possible. 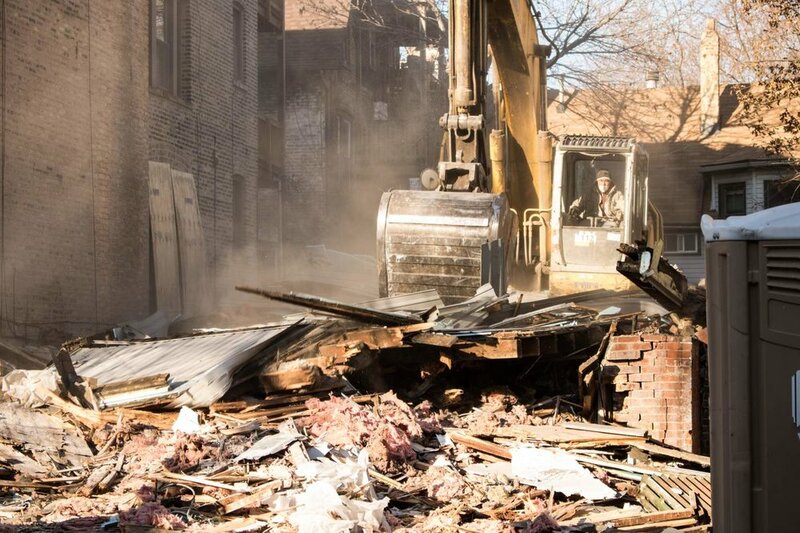 The city of Chicago has numerous laws on the books to protect the public’s health, but public health experts, contractors, and some city officials told Curious City that they are rarely enforced for residential demolition sites. It’s also unclear if city officials are even aware of the potential health risks posed by these kinds of demolitions. 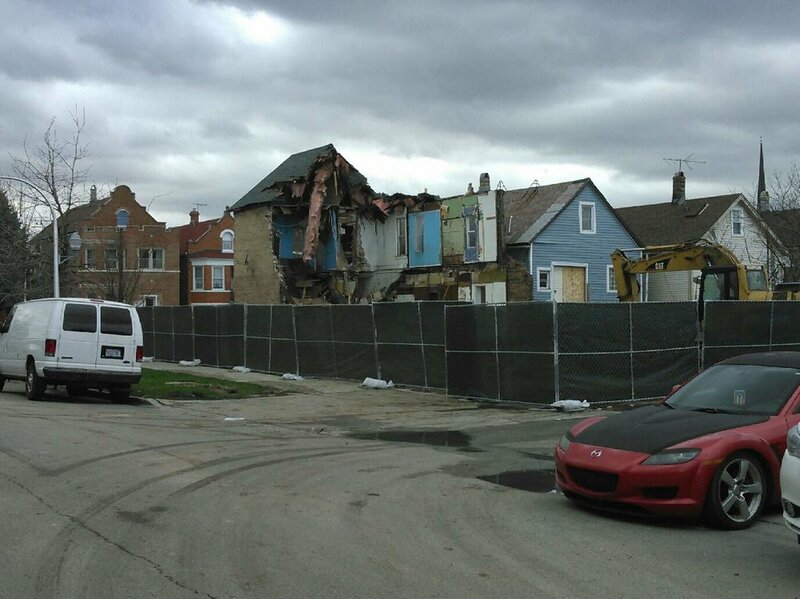 Robert says the demolition site he saw in McKinley Park looked like a “cutaway dollhouse,” with its half-exposed inner rooms and potentially poisonous dust exposed to the elements for hours. In order to reduce exposure to harmful dust, workers suppress dust by wetting down the debris (Courtesy David Jacobs). The city’s permit process — required for all residential demolitions — is supposed to ensure that developers and contractors adhere to best practices for how to handle hazardous materials. • Inform adjacent neighbors within a 75-foot radius about the demolition via certified mail. • Inform the alderman in the ward where the demolition is taking place. In a written letter to the alderman, contractors are required to detail that demolition crews are adhering to best practices for environmental contamination and other issues. • Obtain approvals from various city departments, including plans to deal with water line issues, public street closures, rodents, flammable liquids, and sewers and demolition plans. As for how materials like asbestos are supposed to be managed on demolition sites, the law is clear. Chapter 11 of the city municipal code outlines the procedures that need to be followed: contractors should wet down a site to prevent dust from spreading, wet down and bag potentially hazardous asbestos or other materials and remove debris quickly in covered containers. These steps mirror best practices required by the Environmental Protection Agency for asbestos. While most larger-scale demolition projects require approval from the city’s Department of Public Health, smaller projects — like tearing down single family homes — do not. The city’s Department of Public Health “strongly recommends” contractors hire an expert to handle contaminants for smaller residential demolitions — but doesn’t require it. So, does the law get enforced? The city’s laws and regulations are one thing, but enforcement of those rules is another. Environmental consultant Ian Cull inspects for asbestos at a client's home (Courtesy Indoor Sciences, Inc.). Contractors and environmental health experts say Chicago officials generally do a good job of inspecting and ensuring there are safeguards when it comes to big construction or demolition projects that involve messy environmental issues, like taking down old industrial plants or clearing old gas stations. The city also stays on top of interior home renovations, which could put the homeowner or occupant at risk. But environmental experts and contractors say it’s another story when it comes to the demolition of smaller residential properties. Ian Cull, a Chicago-based environmental consultant who advises contractors on how to handle and remove hazardous materials, says he believes city officials need to pay more attention to residential demolitions. Cull says he often works in nearby suburbs where enforcement is much tougher than Chicago. Cull’s office in is Logan Square, which has a high number of demolitions, according to city data. He says he frequently sees contractors failing to adhere to the best practices outlined by the city. “I could count on one hand the number of demolition projects that I’ve seen that are using water and spraying it,” Cull says. In 2017, the city’s Department of Buildings issued more than 50 citations for improper removal of debris out of a total of more than 1,219 demolition permits, according to city records. Just five of those citations resulted in a fine, according to the city’s data portal. The Department of Public Health, which issues citations to contractors for environmental concerns, issued just one citation and fine in 2017 for a contractor failing to minimize dust during a demolition or renovation, city records show. Department of Buildings Commissioner Judith Frydland says she is not aware of any complaints about her department’s enforcement efforts. She says the department has plenty of inspectors. She also says the buildings department is primarily concerned with ensuring contractors follow the appropriate steps to obtain a permit. “We look for basic safety,” she says. While Frydland says she hasn’t heard any complaints, the alderman of an area that has seen a lot of development says he gets plenty. Ald. Scott Waguespack, whose 32nd Ward includes areas of Bucktown and Lincoln Park, says he gets hundreds of complaints about contractors who don’t control dust, set up fencing, notify neighbors, or display their permit as required. Waguespack, who drives around his ward to check on demolition sites, says contractors know the city rarely inspects for problems like debris removal and hardly issues fines, so they don’t have any incentive to follow the rules. "I can’t write a ticket. If I could write a ticket, I’d guarantee you there’d be like thousands of tickets," he says. Waguespack says he would like the city to deploy more inspectors, particularly during the busy summer construction months. He also says city officials aren’t responsive when he reports a concern. “When there is an issue, we just don’t rely on the Buildings Department,” the alderman says. Contractors we spoke with, like Jose Duarte, the founder of general contractor Blackwood Group LLC, say that while the permitting process is fairly thorough, the city could do a better job of sending inspectors out to sites once demolition is underway. “The Building Department or these enforcement agencies have to be more aggressive on that and distinguish who the bad players and who the good players are,” Duarte says. An Uptown resident watches as a residential building is torn down. There is no wet down of the debris (Photo: Manny Ramos). Waguespack says the city used to be more responsive to these kind of concerns. But he says that’s changed under Mayor Rahm Emanuel, and it has to do with how his administration approaches developers. Emanuel’s spokesman, Adam Collins, and a spokeswoman for the Department of Public Health did not respond to repeated requests for comment about how the city handles environmental concerns related to small residential demolitions. What are the consequences of poor oversight? So, without this oversight, how much do these small construction and demolition sites contaminate the neighborhood? What kind of health risks do they pose? Workers are often those who suffer most from contaminant-related diseases because of weak regulation and enforcement, according to a 2015 investigation from the nonprofit Center for Public Integrity (Photo: Manny Ramos). When it comes to household contamination, experts mostly worry about workers during demolition or children who are exposed. The health risks are serious, and experts aren’t always sure how much contamination people can be exposed to before they develop serious health problems. Lead can cause, among other things, lower IQ and delayed development. Asbestos can cause mesothelioma, a fatal lung cancer, and asbestosis, a chronic lung disease. It’s often workers who suffer most from contaminant-related diseases because of weak regulation and enforcement, according to a 2015 investigation from the nonprofit Center for Public Integrity. Thousands of workers get sick and die from contaminant-related diseases every year, the nonprofit found. David Jacobs, who teaches at the University of Illinois at Chicago and works as the chief scientist at the National Center for Healthy Housing, conducted a federal study on the issuethat was published in 2013. 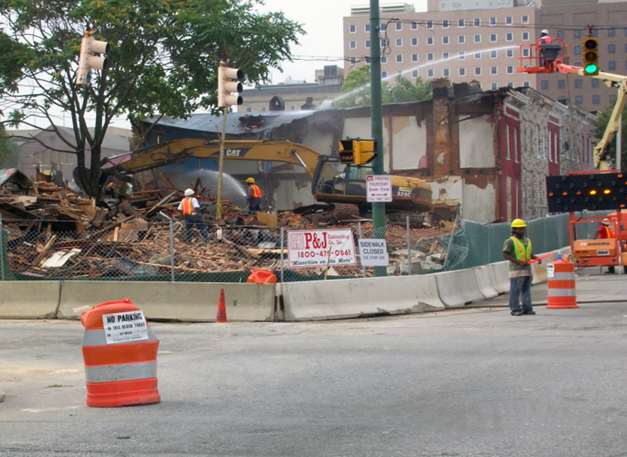 Jacobs tested the quality of the air around dozens of demolition sites in Chicago. He found high levels of lead on average of 400 feet away from the construction sites — meaning contractors weren’t doing a good job containing dust. He brought it up with city officials but they failed to address his concerns, he says. Frydland, the commissioner of the Department of Buildings, argues that smaller demolitions are not a huge problem. Researcher David Jacobs tested the quality of the air around dozens of home demolition sites in Chicago. He found high levels of lead an average of 400 feet away from the sites (Courtesy David Jacobs). “In a single family home, you often don’t have issues that you have in (larger) buildings just in general,” she says. But Jacobs says that while the issue seems like a small one, it is imperative to change how people think about contaminant-related problems. As it stands, most leave it to the doctors to treat illnesses that are caused by these contaminants. Instead, officials should spend more time, money, and effort to ensure people aren’t exposed to as many contaminants in the first place, he says. For his study, Jacobs also measured the amount of lead in dust near residential teardowns in Baltimore. He found that contractors in Baltimore generally paid close attention to contamination issues and frequently adhered to best practices — namely wetting down demolition sites so dust didn’t spread. Interestingly, Jacobs found that compliance was voluntary. There was usually a person on the construction crew who ensured best practices were followed. As a result, the amount of harmful lead in the air was considerably lower than in Chicago. Jacobs says the Baltimore example offers just one possible solution — a contractor community that is hypervigilant to the issues — to ensuring contaminants like dust don’t end up hurting people nearby. Other solutions involve stricter enforcement of the current laws. Robert Beedle has mostly lived in old houses. His childhood home in the Cook County suburb of Riverside will soon turn 100 years old, he says. Robert Beedle (right) visited the demolition site that inspired his question alongside Curious City audio producer Jesse Dukes (middle) and City Bureau reporter Jeremy Borden (left). (Photo: Manny Ramos). Robert is a Ph.D. student in clinical psychology at the Illinois Institute of Technology, and he says the university has motivated him to become more curious and ask questions. He says he’s learned a lot about how the city enforces the rules around demolitions. “If there was a teardown happening next door or a couple houses away, at that point I really would be more concerned,” he says. Robert’s concern isn’t just for himself, but for the future of the McKinley Park neighborhood, where he bought a home in 2015 that was originally built in 1888. “I love this place and want to contribute to making it an even better city to live now and in the future,” he says. All black and white full-size photos by Manny Ramos.